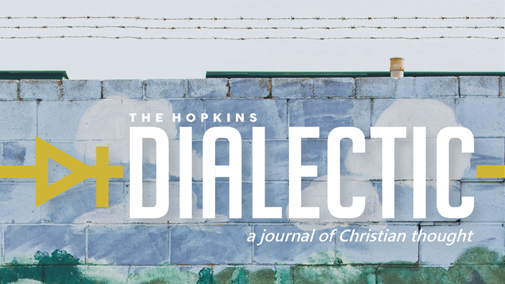 We are the Hopkins Dialectic, the first journal of Christian thought on The Johns Hopkins University campus. As a part of the Augustine Collective, our mission is to promote discussion between Christians and non-Christians on our campus. We are The Hopkins Dialectic, the first student-ran journal for Christian thought on the Johns Hopkins University Campus. As an official member of the Augustine Collective, we share the vision of creating a space to discuss how Christianity intersects with other facets of our life, such as science, philosophy, social justice and literature. Ultimately, our goal is to produce publications which promote embodied discussion between Christians and non-Christians beyond the page. Last spring semester, we launched the first issue of our journal. With great financial support and prayers, we were able to print 550 copies for our inaugural issue and were able to start up our website, www.jhudialectic.org. On this website, you can find a pdf copy of our Spring '16 journal and each individual article. In addition, last spring we were able to host 4 round table discussions on-campus where we discussed the four cardinal virtues Plato first established in The Republic. This project was received well by the student body and we hope to continue these discussions. Overall, our journal has been successful thus far in having a great impact on our campus; however, this coming fall, our hope is to go even further. 1. To print at least 550 copies of our Fall issue to disperse about the Johns Hopkins University Homewood campus. In order to complete all of this, we estimate that we will need a total of $3000. This amount includes the cost of printing out all the journals, and the cost of purchasing supplies and resources to host the events. For this reason, we ask that you please help us however you can through financial donations and prayers. We would greatly appreciate your assistance as we prepare to take our journal ministry to the next level. Thank you for helping us as we seek to impact the lives of our college students.